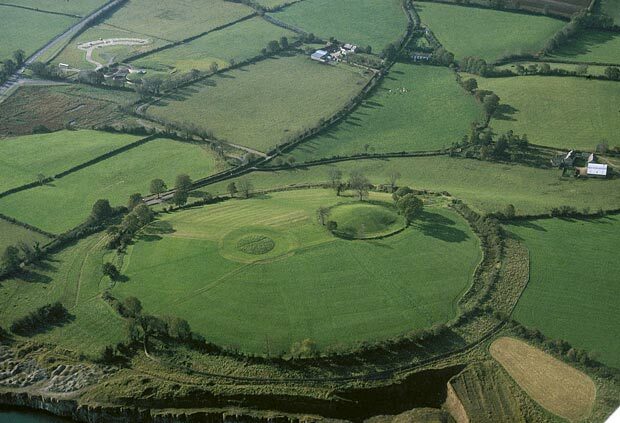 The complex consists of a large circular enclosure known as Navan Fort which is 275m in diameter and encloses the summit of the drumlin. 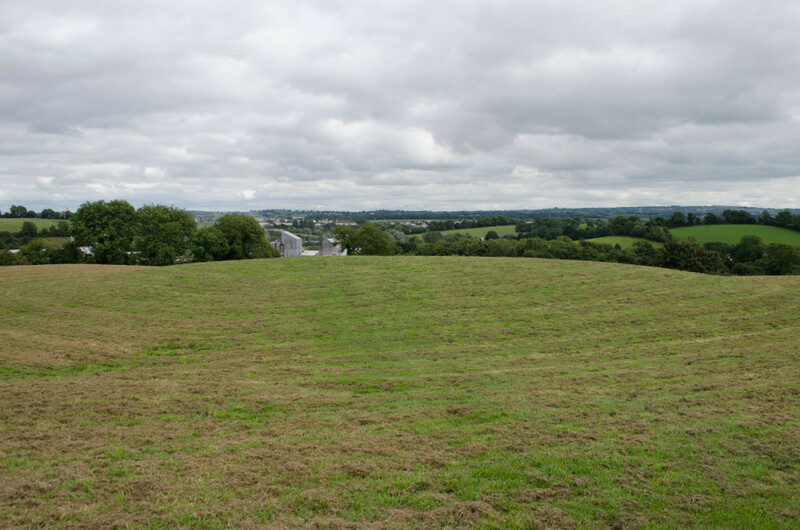 Within the enclosure are two visible monuments: a ploughed-down, late prehistoric ceremonial or burial monument known as a ring barrow denoted as Site A, and Site B; a large artificial mound 6 m high by 40m wide. The main archaeological excavation of the site took place 1961 – 71, with subsequent digs in the late 1990s. 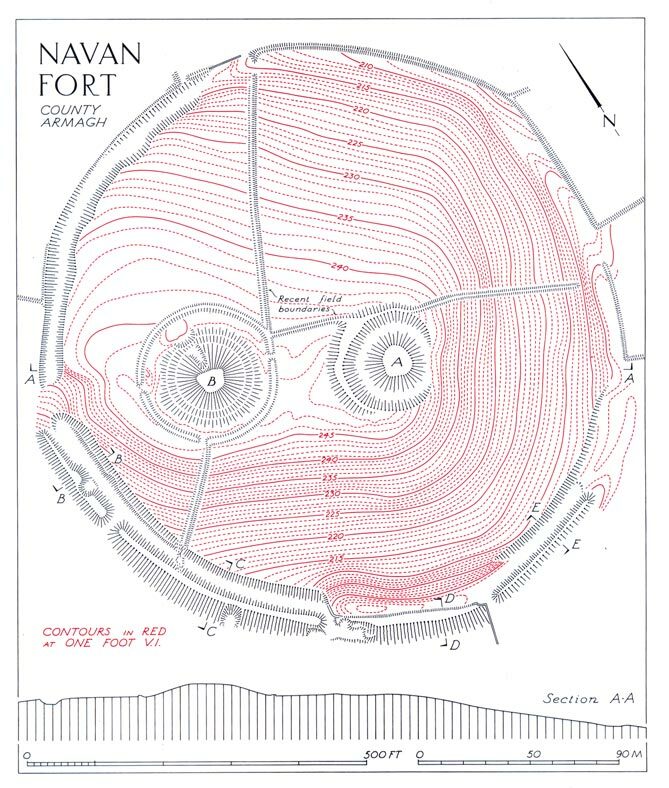 Plan of Navan Fort showing Site A and Site B and surrounding Enclosure [copyright NIEA]. 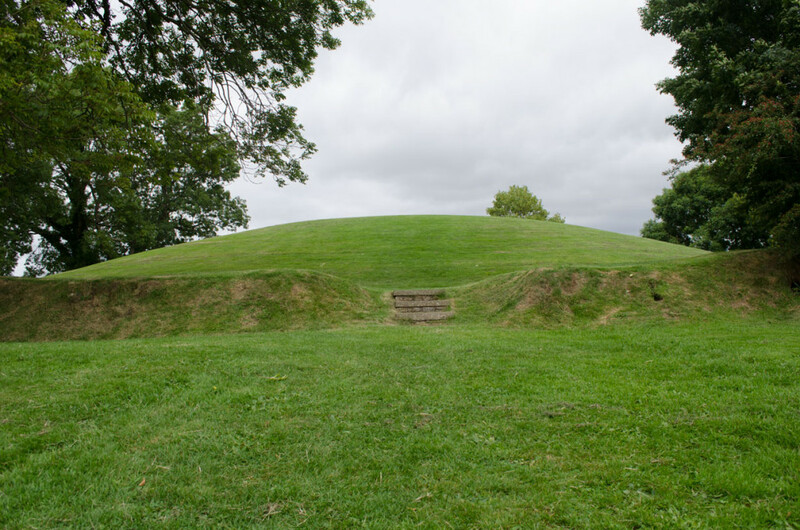 The construction of the enclosure coincides with the creation of the ceremonial mound c. 100BC. 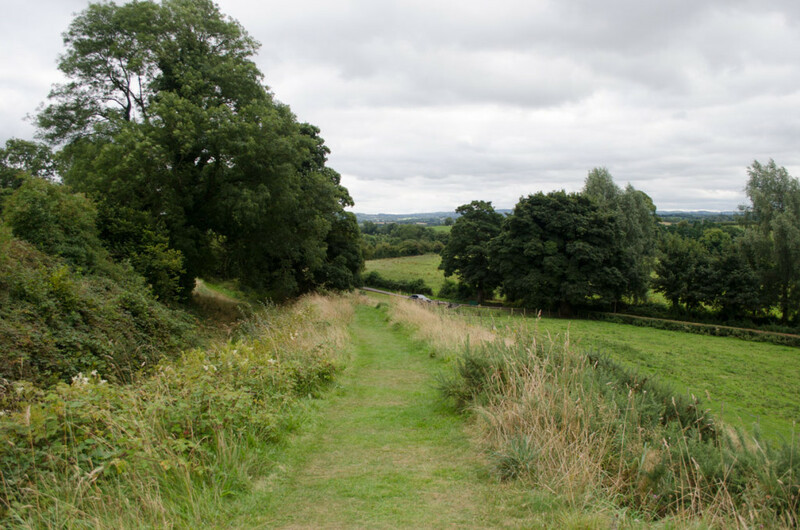 The earthwork consists of a substantial circular ditch with an external bank. The use of an inner rather than outer ditch suggests that the fort was used as a sanctuary or as an enclosed sacred place rather than as a defensive position. Where preserved, the bank is 15m wide and 4m high. The bank has been ploughed down in some areas and the ditch, which has been filled in by years of silting, was considerably lower than its current level. The centre of the ringwork lies 30m south-east of the centre of the enclosure. A ring-shaped hollow is formed from a filled-in ditch which would have been 30m in diameter. Site A‘s features; the small internal area, the lack of entrance and internal ditch suggest it was used as a ceremonial monument. Excavations of the barrow uncovered three concentric slots which may have been used as foundation trenches to secure the bases of wooden walls. A later excavation at Site C, close by, uncovered a similar pattern and the two sets of concentric slots were found to join together to form a large figure of eight structure. This 50 m long, Iron Age structure is contemporary with the construction of large wooden building at site B and can be dated to c. 100BC. Site B lies about halfway between the centre of the enclosure and its perimeter and consists of a large artificial mound, 40m in diameter. Excavations revealed that the mound contained a number of occupation layers dating from the Neolithic period through to the Iron Age. The mound was artificially formed in the Iron Age and consists of layers of soils and turves resting on a mound of stones. This cairn had been created within a wooden building which was then set alight. Underneath the wooden building, layers of concentric slots were discovered which provided evidence of multiple figure of eight wooden structures. This entry was posted in Archaeology, history, Research and tagged archaeology, bronze age, history, iron age, landscape by digkeyltd. Bookmark the permalink.